41186 Azari & the Goblin Forest Escape is an Elves set released in 2017. Escape the carnivorous plants with Azari and Firebolt! 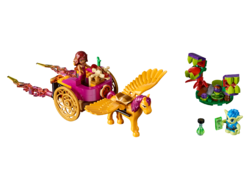 Join exciting adventures in Elvendale as Azari the fire elf evades Guxlin the Goblin and its carnivorous plant traps in her flying Fire Chariot, featuring extending flames, space for up to 3 mini-doll figures, crossbow shooter and her pegasus, Firebolt. Includes a mini-doll figure, plus animal and goblin figures. Includes an Azari mini-doll figure plus Guxlin the Goblin and Firebolt the pegasus figures. Features a chariot with space for up to 3 mini-doll figures, a crossbow stud shooter, extending flames from the back and detachable Firebolt the pegasus. Also includes a plant garden with toppling carnivorous plants. Try to ensnare Firebolt with the plant’s mouth. Push the lever to extend the chariot’s flames and topple the plants. Accessory elements include crossbow ammunition, evil magic potion bottle, map, evil instructions, carrot and 2 evil plant seeds. 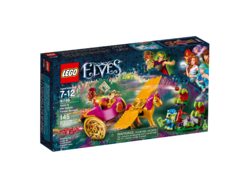 Other mischievous goblin figures can be collected in selected LEGO® Elves sets. Fire Chariot with Firebolt measures over 1” (5cm) high, 8” (22cm) long and 4” (12cm) wide. Facts about "41186 Azari & the Goblin Forest Escape"